As per the title I'm thinking about what ISP and what package would make sense for a holiday let property. Unlike a tenancy the owner would be picking up the tab directly, and would bear any costs from excess usage or toll fraud. We are assuming that a basic Internet service with wireless would be expected by visitors, but I'm not sure whether high speed would be a selling point. The property currently has 21CN ADSL at around 6meg or a little less. FTTP is available. Currently it's Plusnet broadband and BT phone line. Any thoughts on suitable ISP/Services? At minimum we'd want some protection from call charges, either as a cap or by call barring to high cost destinations. Or maybe move the goal posts and disable any outbound calling. I think the package would depend on the market for the holiday let. If it is a property that is aimed at couples in the older end of the market, I suspect that 6M ADSL would be perfectly adequate as usage would probably be limited to browsing and email. If, on the other hand, you are expecting families with teenagers or younger couples then I suggest FTTP might be required to cope with streaming etc. FTTP will obviously limit your choice of ISP though. Personally, when travelling in the UK, I generally disregard whatever broadband might be on offer. I might not trust the privacy/security, or I might not like the small print T&C, so why bother - I simply use my phone’s mobile data, with hotspot enabled for the iPads. If it’s a remote rural location with poor mobile coverage, chances are DSL will be even worse, so nothing lost. I am probably not, however, typical. Re-reading the above, I believe that you wish to provide both telephony and WiFi Internet access for your customers/clients. Is my interpretation correct? We have stayed at quite a few holiday let's and I'm not aware of any that have allowed phone calls, although I wouldn't know if the phone did work as have never tried any. Actually I think one may have had a pay phone. Personally I've never expected phone facilities, but always look for broadband/wifi although often used my mobile but you never really know what reception is going to be like. As others have said speed really depends on who and how many are going to be in the property, but 6Mbps may be a bit slow if likely to have a couple of people streaming. 7LM, have you ever heard of a VPN? I have one setup so if ever on public WiFi I connect through that, spent a week at a hotel in Spain last week, all my WiFi data was encrypted via VPN back to my home router. We've stayed in a lot of holiday lets in St Ives, none have had phone but WiFi is becoming increasingly common. 1) When we’re on hols, all of the home appuratus is normally powered off, as a fire safety precaution. 2) I’d not be prepared to open/forward any inbound ports. Or at least, I am unwilling to put all the extra efforts into security and resilience that would be advisable, were I to allow port forwarding. But even if port forwarding could be avoided, point (1) would still apply. I really have never felt the need for anything more than mobile data, when away. I’ve also never felt inclined towards high bandwidth activities when on hols, such as streaming movies. What’s the point of a holiday, if you do the same as you’d do at home? Others may have different viewpoints. Even travelling in USA a couple years ago with a measly data allowance of 5MB per day, beyond which crippling charges applied, I had no problems adapting my lifestyle to that allowance. I usually turn off everything that I can, including water when away, water being the most important as it can easily go unnoticed. The network equipment, alarm, monitoring equipment and TV server recording TV programs is left on, as is usually one fridge freezer. I presume you often go out, we all go out as we work and the daughters are at school/uni so like an awful lot of properties they are empty for long periods of the day 5 days of the week. When is a fire more likely to start, the 3 or 4 weeks your on holiday, or the 8 hours 5 days of 48 weeks of the year you're just going around normal life? PS. I have a smoke detector linked to the house alarm, and my wife thinks I'm paranoid, but she never complains about me turning off the water after one of her mates came back to a flooded house after a holiday. Thanks all. It's on the outskirts of a small village, so remote but with neighbours. At this stage I'm thinking we should provide at least wireless Internet access, not sure on phones. Might be good to have some provision in case of emergency, but that could be done by leaving a prepaid mobile available. I guess the decision at this stage is whether to sign for a basic cheap service, or whether higher speed of say 40 meg would be a selling point. If there's little difference in price then a 40/10 fftp service would be a good selling point in my opinion. Absolutely no need for anything faster than that. I agree that anything faster than 40/10 is overkill for a rural holiday let. Most people would not expect there to be a working phone line, and would probably have access to their own mobile anyway. I strongly suspect that anything small, portable and valuable (like a prepaid mobile) would soon go missing. So we could get 40meg on FTTP from BT or Zen. Can anyone think of other ISPs who do similar? Actually since it's FTTP can we get that without a phone line at all? It will be 55M rather than 40M with BT, FTTP will probably be VOIP rather than copper voice. You can always have outgoing calls barred as a bolt on. 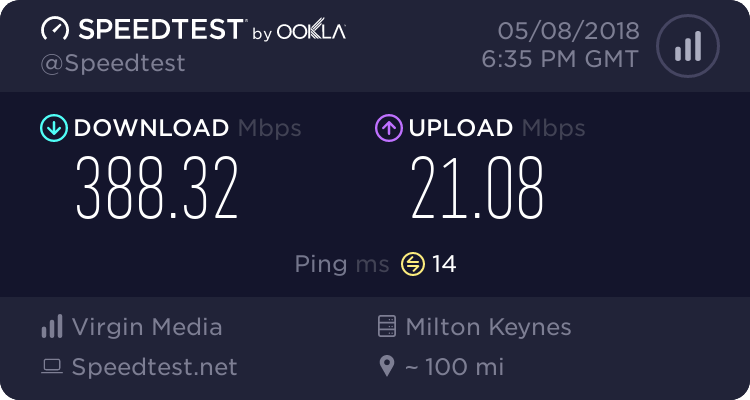 Ignoring the higher speeds, BT offers "SUPERFAST FIBRE Average speed 50Mb" and "SUPERFAST FIBRE ESSENTIAL Average speed 36Mb". I presume for FTTP you should always get the full contracted speed as there's no copper with it's variable losses. Not sure that superfast fibre essential is available via FTTP though, but yes, you will get full speed of whatever package you opt for.